The Palladium Hotel features a range of guestrooms all with private bathroom (bath, WC, hair dryer), double, king or twin beds, fridge, air conditioning, bathrobe, slippers, flat screen Satellite TV, DVD Player, Wi-Fi Internet access, kettle, mini bar, radio, safe, telephone, and a balcony or terrace. Free baby cot available on request. Room categories are: Double Standard with Pool View (max 2 people), Double Standard with Sea View (max 2), Superior Room with Private Pool and Sea View (max 2), Junior Suite with Sea View (max 3), Junior Suite with Outdoor Jacuzzi (max 2), Junior Suite with Private Pool/Jacuzzi and Sea View (max 2), Superior Suite with Sea View (max 4), Connected Family Room with Pool View (max 4), and Deluxe Family Suite with Sea View (max 4). 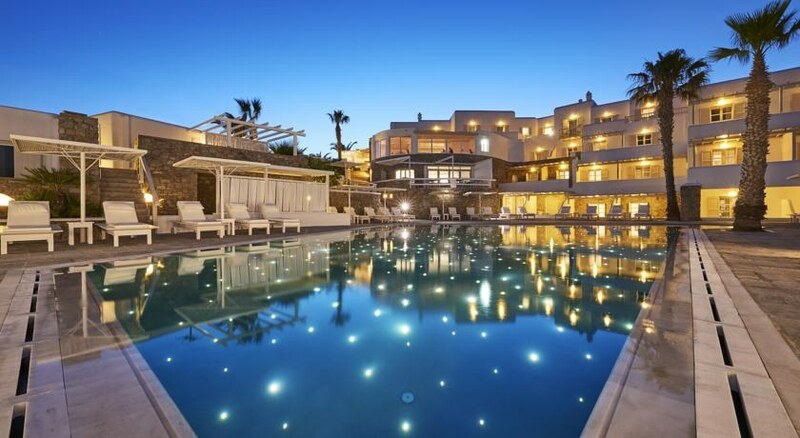 The elegant Palladium Hotel rests on the seafront the picturesque Psarou beach overlooking the sapphire blue Aegean Sea on the island paradise of Mykonos. Built in traditional Cycladic architectural design and recently refurbished and renovated, this sumptuous 5 Star boutique hotel is a holiday retreat for couples with a wide range of shops and restaurants nearby and 40 luxurious guestrooms with modern amenities. Guests to the Palladium Hotel are in close proximity to the magnificent beaches Platis Gialos and Psarou, with charming villages nearby. Experience real Greek hospitality at this 5 Star gem! Mykonos Airport is 3 km from the Hotel. Local Tips: The Palladium makes a fine base for exploring the wide array of superb beaches, smaller villages in the hills and all the many attractions of the Island including the lively clubs, restaurants and bars of Mykonos Town, just 4 km from the hotel. Food, drink and entertainment: Bed and Breakfast accommodation with an option for Half Board. The main La Veranda Restaurant boasts an extravagant open waterfront setting, crisp table linens and luxurious tableware glowing in soft candlelight for an exclusive and legendary experience of hushed privacy and romance. La Veranda serves a rich American buffet breakfast from 8 am to 11:30 am, lunch from 1pm to 4pm, and dinner from 7pm to 11:30 pm. Guests will enjoy the Horizon poolside restaurant, the pool bar and lobby bar. Sports, games and activities: Swimming pool, sun terrace with sun beds and umbrellas, children's pool, Swedish Sauna, outdoor Jacuzzi, massage services, beauty parlour, fitness amenities, gym, table tennis, excursions and outdoor activities available. Additional: 24 hour reception, air conditioned in all common areas, travel desk, in house laundry and ironing service, 24 hour room service, secretarial services, postal services, conference facilities for up to 70 people, doctor on call, twice daily, maid service, complementary transfer from Mykonos airport and the port to the hotel and back, honeymoon fruit basket, H4u guest offer fruit basket and welcome drink on arrival, transfers to Mykonos Town (upon request), parking area.